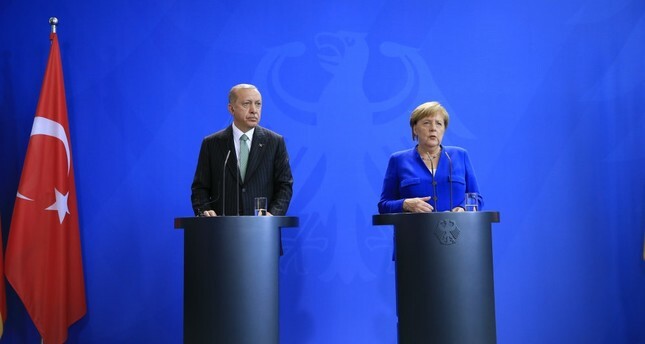 President Erdoğan (L) and German Chancellor Angela Merkel during a press conference in Berlin, Sept. 28. In his visit to Berlin, President Recep Tayyip Erdoğan cited Germany's first Chancellor Otto von Bismarck's words, who said "Die Liebe der Türken und Deutschen zueinander ist so alt," meaning "Turks and Germans loved each other for a long time." This citation was applauded by Germans. Well, why do Germans and Turks today call each other friends again? I think history helps us better see the relations between the two countries in the present day. The legendary German leader Bismarck's policy was based on the strategy of securing order in Europe by cooperating with neighbors and bringing the Ottoman government closer to Germany. In fact, the German strategy after him maintained the securing of trade roads via Ottoman lands to reach the Asian markets from Europe by the Berlin-Baghdad Railway Project, which is similar to today's Southern Gas Corridor (SGC) project of the Caspian regionm – the European pipelines, financed by the European Investment Bank and World Bank. Other than the railway project, the German policy was firm in reaching oil fields in today's Iraqi city of Mosul by cooperating with the Ottomans. The petroleum was seen as strategic material of the future and the Germans thought in the beginning of the 20th century that oil in Mesopotamia would be better than the resources in Baku and cheaper than the American supply to Europe. But German ambitions and rising influence in Ottoman geopolitics caused concerns in London. So, the German strategy was based on keeping Ottoman territorial integrity recognized rather than weakening it like the other global actors were planning to do via dismantling it. It was this strategy took the Ottoman decision makers to ally with Germany in 1914 against Britain and France, who were determined to divide and share the Ottoman territories after the war. Of course, the Turco-German alliance was not melodramatic but a forced marriage. It was proven in September 1918 when the Ottoman troops entered Baku on the request of the Azeri; however, Turkey's ally Germany tried to prevent the Turkish move to defeat Britain in Baku by cooperating with the Soviets, and did not want the Turks to establish influence in the Caucasus oil fields; an area still crucial today for Western energy demand. After the Great War, a new state in the Asia Minor was established by negotiating with the British after the Armistice of Mudros was signed between the Ottomans and Britain on Oct. 30, 1918. Four years later this time not the Ottoman government in Istanbul but the Turkish Republicans in Ankara would be invited to Lausanne in 1922 and the treaty, signed in 1923, after months of negotiations for the Mosul case, settled new Turkey's boundaries, the oil issue and the new Turkish political transformation, which Britain recognized in 1924 after the caliphate was abolished by the Republicans. Thanks to British support, the Turkish Republic was recognized by Western powers. The republic ceded Mosul to Britain after new negotiations in Ankara with the British during 1925, finally signing the Ankara Treaty in 1926. After that Britain, France and the U.S. made the Red Line Agreement to divide and control all Middle Eastern oil resources by drawing a map in 1928. Germany was kept out during the 1920s geopolitical discussions. It returned in the 1930s after Hitler came to power. They claimed they were striking back against imperial Germany by securing their interests in oversea territories. During World War II, Hitler tried to get Turkey to side with Germany. His government promised the then Turkish president İsmet İnönü to grant Mosul to Turkey after the war if Turkey allowed German troops to pass through Turkish soil to reach Iran and Baku. A similar but cheaper promise was made by the Americans to Turkey in 2003 just before the invasion of Iraq. Indeed, the Germans had already gotten Reza Shah, the Iranian ruler, who had come to power with British support in 1925. However the pro-British Turkish government did not side with Germans during World War II. That was because Britain and France this time were not aiming to destroy the Turkish territorial integrity, rather they even had helped Turkey annex the Syrian province of Hatay after 1938. The German goal to secure the trade route passing through Turkey to the East and the energy resources in the Middle East would fail once again after World War II. During the Cold War era and after it, both Turkey and Germany were placed in the Western alliance. However, in the 21st century, once again some new resources were discovered in and around the Middle Eastern region, including the East Mediterranean, and Turkey already linking the Caspian and North Iraq fossil resources to Europe gained capability to cope with the migration crisis that made Turkey more strategic for European security. This time Germany is in a trade war with the Anglo-Saxons, in alliance with France but not promising Mosul to Turkey or crashing Russia. Bismarck's grandchildren well aware of potential gains if they cooperate with Turkey once again on the basis of similar strategy especially after the American attacks on the European economy as well as on Turkey. Given the political sphere drawn into disputes with Washington in recent years, instability in the Eastern Mediterranean virtually poses a threat to Europe which can become a burden on German arms. In this scenario it is obvious if Turkey suffers an economic crisis, it will affect German and other European interests in Turkey, too. In addition to this, today the German strategy is not to fight the other global actors directly but to save considerable shares in the near East, and that policy indeed is not much different than that of Bismarck's in the 1880s. Berlin once again tries to secure its energy resources but this time in cooperation with Russia and Turkey. The German-Russian cooperation, as former German Chancellor Schröder had done in defiance of American pressures, plays a role with Russian President Vladimir Putin through Rosneft, that has helped the Russo-German energy business develop andsee German influence expand from the Russian market to northern Iraq. At the same time, Germany also supports the grater EU energy policy to alternate between Russian and American companies supplying fossil to Europe by via the Caspian with British BP and East Mediterranean resources with French Total. BP, which is one of main operators in the Caspian-Mediterranean-European energy road, has common interests with the German strategy to supply Europe with fossil fuels but the American companies seem to harden business on the above mentioned energy road, amid the jeopardized U.S.-EU trade deals and the U.S. energy giants insistence on taking the lion's share in the Eastern Mediterranean. The EU, however, supports billions of dollars of the SGC project, but Europe lacks U.S. support not only from a financial perspective but also from a security point of view. Germany now has to manage the migration crisis, cope with security issues on commercial roads and help the regional countries in the Balkans and Mediterranean create stable allies for Europe via trade deals and political means. However, getting Turkish consent for a cheaper deal seems contentious for a regional player with a population of 80 million. Bismarck had realized that Britain was more successful than France in dealing with the Muslim world and the Anglo-Russian peace was a necessity for the European concert, whereby Germany could rule the continent. Today both seem gone but his strategy still exists in Berlin. As an alliance with the Anglo-Saxons appears to be more costly now, Germany prepares itself to deal with regional allies on its own and create more friendly attitudes toward Europe. German-led EU strategy needs Turkey to barricade the migration flow to Europe from the East, and to recover the Turkish economy for the maintenance of EU–Turkish trade and security-based cooperation. Hence what Erdoğan referred to was not a melodramatic approach concerning Bismarck or his grandchildren but a declaration of the will to cooperate with German assertiveness in Euro-Eastern relations for common stability. Perhaps we can see this as a new forced marriage amid the global trade wars.